In a recent decade, the ability of nanofluid in enhancing the heat transfer is considered as the one of its major usage. Due to this property, it can be utilized in oil and gas industries. In this research, sol-gel method is employed to synthesis TiO2 nanoparticles. Particle size analyzer, X-ray diffraction, scanning electron microscopy and fourier transform infrared spectroscopy are used to determine the characterization of TiO2. 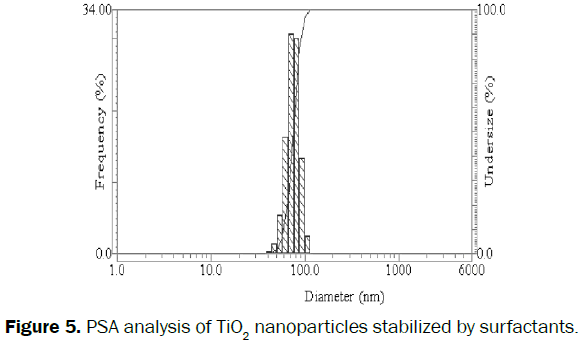 The results demonstrate that the synthesized TiO2 nanoparticles have a good scatter and thin size distribution; also it is shown that the average size of nanoparticles is about 20 nm. The stabilization of Titania nanofluid is optimized by two factors of CTAB surfactant and pH. To improve the thermal properties, nanofluid is added to drilling fluid. Titania nanofluid is characterized by particle size analyzer and sedimentation test. The results indicate that the size of nanofluid is 60 nm. Furthermore, it is observed that adding nanofluid to drilling fluid leads to increase about 150% in thermal conductivity coefficient. Nanofluid, Drilling fluid, Thermal conductivity, Stability, Sol-gel. This template, modified in MS Word 2003 and saved as “Word 97-2003 & 6.0/95 – RTF” for the PC, provides authors with most of the formatting specifications needed for preparing electronic versions of their papers. All standard paper components have been specified for three reasons: (1) ease of use when formatting individual papers, (2) automatic compliance to electronic requirements that facilitate the concurrent or later production of electronic products, and (3) conformity of style throughout a conference proceedings. Margins, column widths, line spacing, and type styles are built-in; examples of the type styles are provided throughout this document and are identified in italic type, within parentheses, following the example. Some components, such as multi-leveled equations, graphics, and tables are not prescribed, although the various table text styles are provided. The formatter will need to create these components, incorporating the applicable criteria that follow. Drilling is one of the most important steps in hydrocarbon reservoirs production. Drilling fluid has an essential role in oil and gas wells drilling that do the task of caring cuttings to the surface, cooling and lubricating the bit, cleaning the bottom hole and etc. A costly part of drilling steps is the failure of bit that is due to the crushing rigid rock and high temperature at the great depth [1,2]. To prevent the failure of bit caused by high temperature, some additives can be used to drilling fluid. An important factor in bringing down the bit temperature is, increasing the heat transfer rate. Thus, with increasing the heat transfer between the bit and drilling fluid, the bit remains cooler. In the other hand, increasing the heat transfer rate causes the faster temperature drop. There are many nanoparticles to increase the thermal conductivity and Titania nanoparticle (n-TiO2) is one of them that it is used in this study. Palabiyik examined stability and thermal conductivity of the various percentages of TiO2 in propylene glycol at 20-80°C temperature range. They showed that increasing the thermal conductivity had a nonlinearly relation with concentration and was independent of temperature . Murshed studied the thermal conductivity of water solutions including n-TiO2 in cylindrical and spherical shaped and concluded that the presence of surfactant lead to greater stability of nanoparticles in base fluids and ensuring the high performance nanofluid heat transfer and the heat transfer coefficient raised with increasing volume percent of nanoparticles . Silambarasan. tested viscosity and thermal conductivity, sub-micron TiO2 dispersed in water by ultrasonication, stirred bead milling and showed that the dispersion of nanoparticles in comparison with water rises the thermal conductivity and can be used as cooling fluid . Duangthongsuk studied the effect of temperature dependence on thermal conductivity and also the effect of viscosity of TiO2 water nanofluids at different percentages volume concentration of TiO2 and showed that the thermal conductivity of nanofluids increases with increasing temperature and also the nanoparticle concentration . Yurong He investigated the stable solution for TiO2 nanofluid with the differential nanoparticles size and various concentrations due to measuring thermal conductivity. Also they studied on the flow behavior in vertical pipe in both laminar and turbulent flow and showed that the thermal conductivity rises with increasing nanoparticles concentration and as well as decreasing nanoparticle size . Abbasian studied the effect of diameter on efficiency of heat transfer and pressure drop of water-based TiO2 nanofluid and concluded that nanofluids with 20 nm diameter, have the maximum thermal performance factor in the range of Reynolds number and volume concentration 0.1-0.2 . Nasiri reported the effect of CNT structures (five different structure) on thermal conductivity and stability of water based nanofluid and showed that the increasing number of nanotube wall, decrease stability and thermal conductivity [9,10]. William et al. reported the effect of CuO and ZnO nanofluids in Xanthan gum on thermal of water-based drilling fluid and showed the increase in thermal of nano water based drilling fluid compare with water based drilling fluid and the increment in nanoparticle concentration increased the thermal . Sahooli studied the thermal properties of CuO nanoparticles on the ethylene glycol–water mixture and showed the optimum thermal conductivity increment at 70°C is 1.66 . In this work, n-TiO2 is synthesized by sol-gel method and characteristic by fourier transform infrared spectroscopy, particle size analyzer, scanning electron microscope and X-ray diffraction. Then TiO2 nanofluid is produced and studied by two factors surfactant concentration and pH. TiO2 nanofluid is characterized by particle size analyzer. Finally, the optimum surfactant and pH nanofluid is added to drilling fluid and then thermal conductivity is tested. Titanium tetrachloride (TiCl4), methanol (CH3O), cetyl trimethyl ammonium bromide (CTAB) surfactant, hydrochloric acid (37%) and sodium hydroxide (NaOH) are purchased from chemical Merck Company and also bentonite purchased from National Iranian Oil Company. To synthesize n-TiO2, 2 ml TiCl4 is added drop wise into 20 ml methanol while stirring at room temperature. Mixing is performed under a fume hood due to a large amount of HCl gas is generated during the process. The produced yellow solution is allowed for a while to be cool, and then it is gelatinized. The obtained sol-gel is placed under the aging process for 4 hours. The final sol-gel solution is dried by oven in the temperature 80°C, so dry-gel is obtained. Eventually, the dry-gel is calcinated in the range of 100 to 750 °C for 1.30 hr. The obtained powder is TiO2 nanoparticles. CTAB surfactant and water based fluid is used to prepare TiO2 nanofluid. Different amounts of surfactant are used in a certain amount of n-TiO2 in order to produce Titania nanofluid. The ratios of nanoparticle to surfactant are as follow that are investigated, respectively 1:1, 1:2, 2:1, 3:1, 4:1, 5:1. Preparation of nanofluid is carried out in two stages: first, the nanoparticles and surfactants are added to thewater base fluid, and stirred for a 30 min by a magnetic stirrer. In the second stage, the mixture is sonicated due to further dispersion of nanoparticles in the base fluid for 15 min. To prepare for water based fluid drilling, 350 ml of deionized water and 10 gm bentonite are mixed and then stirred with Batch Mixer Hamilton. The Titania dioxide nanofluid is prepared in optimum surfactant concentration and pH arranged with a certain volume fraction. Then it is added to the fluid drilling and mixed by Hamilton stirrer for 30 min in order to uniform the fluid drilling. Nanofluid based fluid drilling with different percentages of volume fraction is prepared separately for thermal conductivity measurement. n-TiO2 are characterized by fourier transform infrared spectroscopy (FTIR), particle size analyzer (PSA), scanning electron microscope (SEM) and X-ray diffraction (XRD) and TiO2 nanofluid is characterized by particle size analyzer. FTIR and XRD analysis are used to verify the n-TiO2. The FTIR of n-TiO2 in KBr pellets are recorded on a FT-IR BRUKER-IFS 48 spectrophotometer (Germany). Particle size analyzer of n-TiO2 and nanofluid is recorded by using a Horiba-LB-550 PSA. SEM is a system to determine the morphology and the size of synthesized n-TiO2. The characterization of n-TiO2 morphology is analyzed by SEM. For the FT-IR (Perkin Elmer Spectrum One), TiO2 are pressed into a pellet and scanned from 500 to 4000 cm-1 with a resolution of 4cm-1. The FT-IR diagram of n-TiO2 is observed in Figure 1. 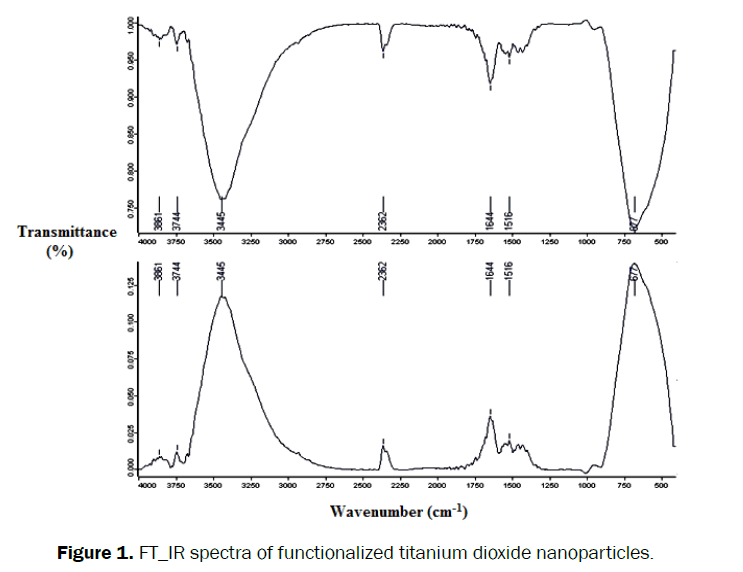 Figure 1: FT_IR spectra of functionalized titanium dioxide nanoparticles. The XRD analyzer of n-TiO2 is carried out by Unisantis XMD 300, X-ray diffract meter and systematic Xpert PRO X-ray diffraction (landa=0.17890nm). Confine used is started at 30-75 in stages of 0.02 with a count time of 1s. Figure 2 presented the XRD patterns of n-TiO2 that it is the same as XRD pattern of the reference. 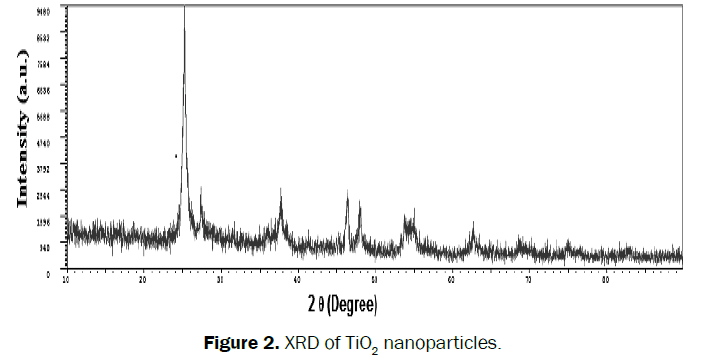 Figure 2: XRD of TiO2 nanoparticles. In Figure 3, the SEM image of n-TiO2 is observed as spherical, homogeneous and uniform particles. Fourier transformed infrared spectroscopy (FT-IR) are used to analyze the TiO2. The PSA analysis of synthesized nanoparticle and nanofluid in the presence and absence of surfactant are presented in Figures 4-6, respectively. 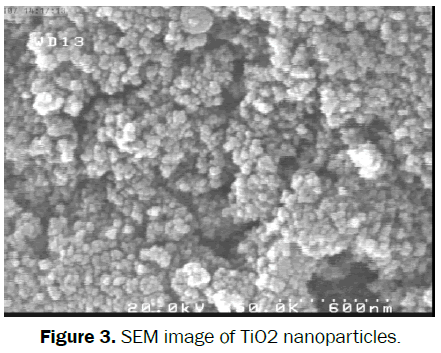 Figure 3: SEM image of TiO2 nanoparticles. 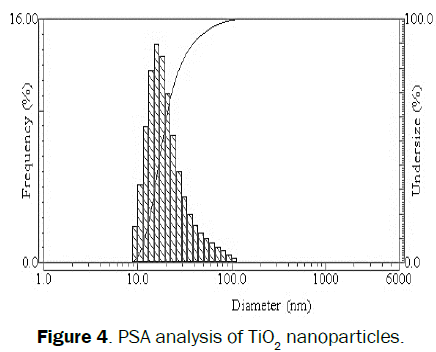 Figure 4: PSA analysis of TiO2 nanoparticles. Figure 5: PSA analysis of TiO2 nanoparticles stabilized by surfactants. 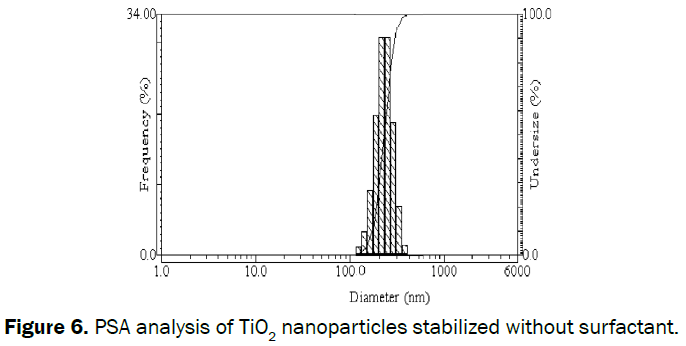 Figure 6: PSA analysis of TiO2 nanoparticles stabilized without surfactant. The results indicate that the size of synthesized nanoparticle is about 20 nm and also the nanofluid average size in the presence and absence of surfactant are about 60, 100 nm, respectively. In Figure 6 it is seen that in the absence of surfactant, n-TiO2 agglomerated. Therefore, the particle size becomes larger. So they place outside of the nanometre range (above 100 nm), whereas in the same condition, in the presence of surfactant, the size of nanoparticles reduce and locate in the range of nanoparticle size. It is shown in Figure 5. To investigate the stability of nanofluid sedimentation test are used. The prepared samples are given one month time and finally deposition of them is checked. Sedimentation tests of each sample are seen in Figure 7. Figure 7: Sedimentation test for determining the optimal concentration of surfactant. According to Figure 7, the most stable state for Titania nanofluid is related to the sample that has 5:1 proportion. In this case, Titania nanofluid has remained stable and deposit is not seen, after one month. One of the factors affecting on stability of the nanoparticles is the surface charge density of the nanoparticles. Increase in surface charge of nanoparticles, enhances the electrostatic repulsion to overcome the attraction between nanoparticles and thus it reduces the adhesion of nanoparticles. The changes of pH can alter the surface charge of the particles and impact the stability of the nanofluid. To investigate the effect of pH on Titania nanofluid stability, the nanofluid is prepared at the optimal surfactant concentration and then the pH changes occur. Sedimentation test is shown in Figure 8. According to Figure 8, the minimum deposit amount and the maximum stability are observed, when pH is equal to 10.9. 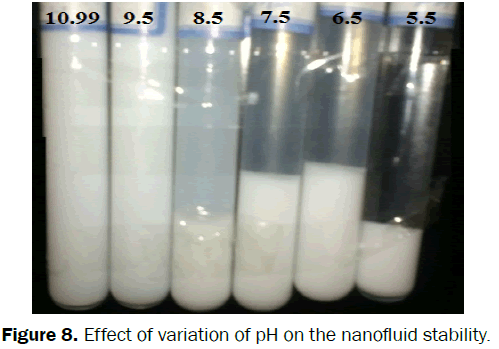 Figure 8: Effect of variation of pH on the nanofluid stability. As the temperature increase due to increase in depth in drilling operation, the bit may be damaged significantly because of the accumulation of heat in it. In this condition, drilling fluid plays the role of heat condition and prevent from heat accumulation in the bit. Therefore, nanofluid is added to drilling fluid to increase its thermal conductivity that results improving in fluid heat transfer. The results are shown in Figure 9. Figure 10 illustrates the ratio nanofluid thermal conductivity of drilling fluid to base drilling fluid. As it is seen in Figure 10, the addition of nanofluid to drilling fluid increases the thermal conductivity by about 150 percent, which is very impressive. It also indicates that increase in concentration of nanoparticles enhances the heat transfer coefficient significantly. Figure 9: Variation of temperature versus time for drilling fluid at different concentration of nanoparticles. Figure 10: k/kb versus time for drilling fluid at different concentration of nanoparticles. In this study, Titanium dioxide nanoparticles are synthesized via sol-gel method. The size of nanoparticles is 20 nm. The optimization of surfactant concentration and pH for stable Titania nanofluid are provided. The stable nanofluid is obtained in 5:1 molar ratio of CTAB surfactant to nanoparticles of Titanium dioxide and 10.9 volume of pH that in this condition the nanofluid is stable more than one month. With the preparation of nano Titanium dioxide with one volume fraction percent and adding to drilling fluid, a significant increase in heat transfer coefficient and thermal conductivity is observed in fluid drilling nanofluid base compare to fluid drilling without nanofluid. Increase in heat transfer can be rise with increasing concentration of nanoparticles. By changing the concentration of nanofluids from 0.1 to 0.3% volume fraction, the increase in thermal conductivity is going up, but this increase is not dramatic. NJ Adams. Drilling Engineering, pennwell Books 1991; 227-277. AT BourgoyneJr, et al. Applied Drilling Engineering, 2nd, 1991;42-82. Palabiyik I Z, et al. Dispersion stability and thermal conductivity of propylene glycol-based nanofluids, J. of Nanoparticle Research, 2011; 13:5049-5055. Murshed SMS, et al. Enhanced Thermal Conductivity of TiO2-Water Based Nanofluids, Int. J. of Thermal Sciences 2005; 44:367-373. Silambarasan M, et al. Viscosity andThermal Conductivity of Dispersions of Sub-micronTiO2 Particles in Water Prepared by Stirred Bead Milling and Ultrasonication, Int. J. of Heat and Mass Transfer 2012; 55: 7991-8002. Duangthongsuk W and Wongwises S. Measurement of Temperature-Dependent Thermal Conductivity and Viscosity of TiO2-Water Nanofluids, J. of Experimental Thermal and Fluid Science 2009; 33: 706-714. YHe, et al. Heat Transfer and Flow Behaviour of Aqueous Suspensions of TiO2 Nanoparticles (Nanofluids) Flowing Upward Through a Vertical Pipe, Int. J. of Heat and Mass Transfer 2007; 50: 2272-2281. AArani AA and J Amani. Experimental Investigation of Diameter Effect on Heat Transfer Performance and Pressure Drop of TiO2–Water Nanofluid, J. of Experimental Thermal and Fluid Science 2013; 44: 520-533. Nasiri A, et al. Effect of CNT structures on thermal conductivity and stability of nanofluid, Int. J. of Heat and Mass Transfer 2012; 55:1529–1535. Nasiri A, et al. Efect of dispersion method on thermal conductivity and stability of nanofluid,Exp. Thermal and Fluid Science 2011; 35: 717–723. William JKM, et al. Effect of CuO and ZnOnanofluids in xanthan gum on thermal, electrical and high pressure rheology of water-based drilling fluids, J. of Petroleum Sci. and Eng. 2014; 117:15–27. Sahooli M and Sabbaghi S. Investigation of thermal properties of CuO nanoparticles on the ethylene glycol–water mixture, Materials Letters 2013; 93: 254–257.